Foliar sprays are a useful method for providing nutrients to plants through their leaves. Foliar sprays are most useful for trace nutrients, but they can also be a good way to supplement primary nutrients such as nitrogen. They are not a replacement for normal fertilizing through the soil, and remember that plants primarily take in water through their roots - not their leaves. Because foliar sprays work via direct absorption by the leaves, they are faster than soil application of fertilizer for fixing obvious nutrient deficiencies. Urea is one of the main chemicals in urine. It is an excellent source of nitrogen. This recipe makes a liter of urea solution. Determine the concentration of your spray. Most urea foliar sprays are between 0.5 percent and 2 percent urea. If you're trying to make a small amount of urea work for a lot of plants, consider using a concentration of 0.5 percent. If nutrient deficiencies are obvious , use closer to 2%. Plants lacking in nitrogen may grow slowly or show decay or discoloration or the leaves, starting with lower leaves first. Weigh out your urea powder. For 0.5 percent, use 5 grams of powder. For 2 percent, use 20 grams. Mix the powder with one liter of water. Use a measuring cup to get the right volume, or use a large, one liter water bottle. Stir or shake the mixture until all the urea is dissolved. Fill a spray bottle with the urea solution. 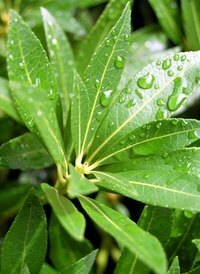 In the early morning or at night, spray your plants' leaves with the urea solution. A light coating will do - just make sure to spray the whole plant. Plants often close their stomata during the hot part of the day, which would limit nutrient absorption. Observe your plants closely over the next few days or weeks to see if there is an improvement in their condition. If not, they may be deficient in some other nutrient aside from nitrogen.